It's Christmas all year round thanks to Microgaming, the leading Canadian online casino game developer with Ho Ho Ho online slots, a colourful free game that has 5 reels and 15 pay lines. If you were not naughty this year you may have the chance to win the maximum cash jackpot of $7,500. The betting range is a wide one, as you can wager between 1 cent and $75 for each and every spin. Try it for yourself, free and with no registration required right here. The game has a Wild and Scatter symbol, a multiplier, and free spins, but you will not see a bonus game. The Christmas themed symbols in Ho Ho Ho are a present, Santa, a Christmas tree, a reindeer, a sled, a cake, turkey, eggnog, and a candy cane. The Santa symbol is the Wild and, other than the present Scatter symbol, it can be used to replace any other symbol to give a winning combination. The Scatter not only increases your win, but hitting three or more will win you up to 20 free spins with all winnings doubled. There is a unique gamble feature where after every win you can gamble your prize, picking the right card suit colour to double your winnings. This can be repeated until you hit the prize limit. 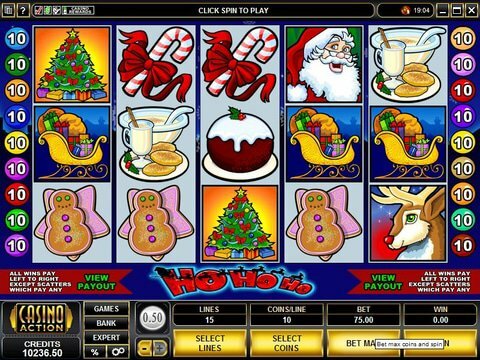 The graphics in the Ho Ho Ho slot machine are cartoon like and very colourful and the sounds will make you feel like its Christmas. In the demo mode you can play the game for free and in the expert mode you can use the auto-spin feature. All Canadian players should have a read of our Jackpot City review before heading to the site to play the full version of Ho Ho Ho. This online casino also offers a deposit match of 100%, up to $500, for new Canadian players and also offers a lucrative no deposit bonus of $10!